In this install­ment we vis­it a pair of St. Paul cof­fee hous­es and a pair in Min­neapo­lis. One of the lat­ter offers baked goods from a lit­er­al­ly world-class prac­ti­tion­er. Rose Street’s mot­to is “Authen­ti­cal­ly French minus the air­fare”; they live up to this aspi­ra­tion. The own­er and chef, John Kraus, is a grad­u­ate of Chicago’s French Pas­try School. His ini­tial for­ay in the Twin Cities was Patis­serie 46 in the King­field neigh­bor­hood of Min­neapo­lis; Rose Street is an out­growth of that delight­ful venue. Kraus was the first Amer­i­can induct­ed into Relais Desserts, which the Strib called the “secret order of the world’s bak­ing elite.” Here’s a video clip of Kraus with a Scot­tish com­pére on the YouTube chan­nel of Relais Desserts. Hard sur­faces abound in this large space with an indus­tri­al feel. A Strib review from a year ago notes that the space was designed by Peterssen/​Keller Archi­tec­ture of Min­neapo­lis. The floor is cement, the walls stone, the counter mar­ble and glass (show­cas­ing pas­tries as if they were pre­cious jew­els — see pho­to). An entire wall of win­dows faces north. Seat­ing is at four long wood­en tables with match­ing chairs, and two small­er tables at the win­dow. There is no soft seat­ing. Fans high up against the black ceil­ing kept the air mov­ing, and not in a wel­come way on the cold day of our vis­it. This is not a place to hang out with cof­fee and a lap­top. It is a place to sam­ple some of the best baked goods you will ever encounter. Also, come warmer weath­er, we intend to go back for take-out to con­vey to Beard’s Plai­sance, the near­by pock­et park over­look­ing Lake Har­ri­et. Vibe — Katharyn: indus­tri­al; Kei­th French. Crowd — Mixed, 20s to retire­ment age. Pret­ty much every­one was dressed in black; for some of them this was because they had left their win­ter coats on (us includ­ed). Two busi­ness types had spread doc­u­ments all over one large table. Wi-Fi — 114.0 Mbps down, 22.2 Mbps up; laten­cy 22 msec. Pro­vi­sion­ing by Com­cast Res­i­den­tial. Per­haps one or two oth­er devices on the Wi-Fi; only 8 oth­er access points vis­i­ble, so a qui­et neigh­bor­hood. Not to prej­u­dice the review, but I was unable to con­nect ful­ly to either the 2.4 or 5 GHz access point; no DNS ser­vice ever acti­vat­ed. The above mea­sure­ment came from Katharyn’s com­put­er, which was able to con­nect on one of half a dozen attempts. Staff — Young. Thin. Seri­ous. Dressed in black. Beans — None for sale. Cup — The source of Rose Street’s beans was not evi­dent. I had a lat­te and Katharyn got the sea­son­able vari­a­tion with cin­na­mon and car­damom. They were not dec­o­rat­ed but were yum­my. 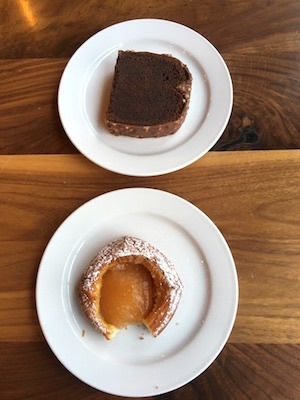 Food — We had pas­tries — an absolute­ly fab­u­lous apple Dan­ish for me and an even more won­der­ful choco­late pound cake for Katharyn (see pho­to). The menu includes break­fast items, piz­zas, and even mac-n-cheese, and there is a short list of wines and beers avail­able. Music & noise — The music rode under the con­ver­sa­tion­al buzz in the high-ceilinged space. Dog­wood is a “small, qual­i­ty-focused” roast­er based here and in and Win­nipeg, Man­i­to­ba. They sup­ply beans to a num­ber of Twin Cities cof­fee hous­es, for exam­ple Black in St. Paul. The oper­a­tion runs three cof­fee bars in the Cities; the one in St. Paul is north of Uni­ver­si­ty. In this loca­tion four east-fac­ing win­dows allow a lot of light. They are equipped with translu­cent grey shades against direct sun­light, but the 4-sto­ry apart­ment build­ing across the street blocks much of the ear­ly morn­ing sun. LED tube light­ing fills in the dark spaces. Some of the seat­ing is sol­id wood­en booths, for 2 or 4, that make fine work­spaces. Four wide plush chairs sur­round a cof­fee table equipped with the Times and the Jour­nal (for those who pre­fer paper). There is a let­ter­press print shop next door, Stu­dio In Fire, that shares the front entrance. Three large pic­ture win­dows look into it so Dog­wood patrons can watch the print­ers at work, and vice ver­sa. Vibe — Katharyn: bright; Kei­th nifty. Crowd — 20s to 50s. Staff — notably per­son­able. These baris­tas look you in the eye and smile and seem to mean it. Beans — On the day of our vis­it only a few vari­eties were on sale, includ­ing a “Zam­boni” cold brew, all $18 to $20 per 12 oz. and all organ­ic and fair trade. 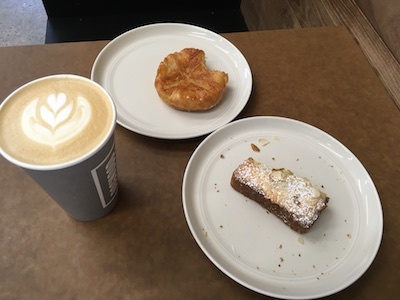 The barista told me that the bean sup­ply took a hit over the week­end and that the sup­ply is refreshed on Tues­days and Fri­days. Cup — Katharyn had a Gibral­tar: half espres­so and half foamed milk served in a shot glass. I tried the Camper sig­na­ture spe­cial­ty cof­fee, with maple syrup and hick­o­ry smoke fla­vor; it arrived dec­o­rat­ed. Both were excep­tion­al. Food — Pas­tries are from Rus­ti­ca Bak­ery. We ordered a bar and a sweet cake (see pho­to). On anoth­er vis­it I had a ham and cheese break­fast crois­sant. Every­thing was entire­ly sat­is­fac­to­ry —Rus­ti­ca does great work. The East Lake loca­tion of Dog­wood Cof­fee, across Lake Street from the Hi-Lo Din­er, shares space with a work­shop and gallery called For­age, which is inter­est­ing in its own right. The design of this space has a feel­ing of delib­er­ate­ness and inten­tion­al­i­ty. We sat in a 2-per­son booth whose light­ing and elec­tri­cal arrange­ments made it feel like a still life; the espres­so machine is a work of art (see pho­to). The open­ness of the shop with the next-door gallery does not con­tribute to the over­all drafti­ness; the space is com­fort­able. The only dis­cour­age­ment to a long vis­it might be the hard-sur­faced seat­ing. Vibe — Katharyn: gemut­lich; Kei­th clean. Wi-Fi — 64.9 Mbps down­stream, 13.1 Mbps up; laten­cy 24 msec. Pro­vi­sion­ing by Com­cast Busi­ness. Staff — friend­ly and expert. Beans — On the day we vis­it­ed, 7 vari­eties plus a decaf in the bean were on sale, $18 to $20 per 12 oz. All organ­ic and fair trade. In addi­tion there was a 6-pack sam­pler, the Cof­fees of La Lia Vari­ety Project, from long-time sup­pli­er the La Lia plan­ta­tion in Cos­ta Rica. Cup — Katharyn had a pour-over decaf (with incred­i­ble cream from Autumn­wood Farm), and I tried an Alta Pal­la sparkling blood orange soda. If you have had San Pel­le­gri­no sparkling fruit drinks, this is like that, but organ­ic and fair-trade accord­ing to the mak­ers in San Fran­cis­co. Food — Only pas­tries and one toast “dish” are on the menu. Two beers and two wines are also list­ed. Music & noise — The music was at a low lev­el but dis­tin­guish­able. Exam­ples: Exit Music for a Film by Radio­head (from OK Com­put­er); Mia­mi by Foals. Con­ver­sa­tion­al buzz was quite mut­ed in the high-ceilinged space. This cof­fee shop (which the menu notes is “with­in the bound­aries of the Cre­ative Enter­prise Zone,” but not an offi­cial CEZ busi­ness) is also the home of the Small­est Muse­um St. Paul, brain­child of co-own­er Shan­non For­ney. Unfor­tu­nate­ly the muse­um was emp­ty dur­ing our ear­ly 2017 vis­it: its ini­tial grant had paid for a year of month­ly exhibits, but ran out in mid-2016. Hap­pi­ly, the muse­um is back up and run­ning month­ly exhibits now. The estab­lish­ment is easy to get to: it’s on the Green Line a block from the Ray­mond stop. We vis­it­ed on an extreme­ly busy Sat­ur­day — that week­end the cof­fee house (along with hun­dreds of oth­ers nation­wide) was donat­ing a por­tion of prof­its to the ACLU. Seat­ing is three big com­mu­nal tables that could seat 8 each and a half dozen small­er tables. Chairs are hard wood, stu­dent-lev­el. Out­lets are not in abun­dant sup­ply (but I found one). Vibe — Katharyn: drafty; Kei­th alive. Crowd — Most­ly stu­dents & twen­ty-some­things. Wi-Fi — Un­usable dur­ing our vis­it. The guest Wi-Fi has a pass­word and I con­nect­ed sev­er­al times but nev­er got DNS ser­vice. Used my iPhone’s mobile hotspot instead. 26 Wi-Fi access points were vis­i­ble dur­ing our vis­it (includ­ing one oth­er iPhone doing as I was), so the wire­less environ­ment was quite crowd­ed. Staff — Upbeat and friend­ly. Beans — From Boot­strap Cof­fee Roast­ers. 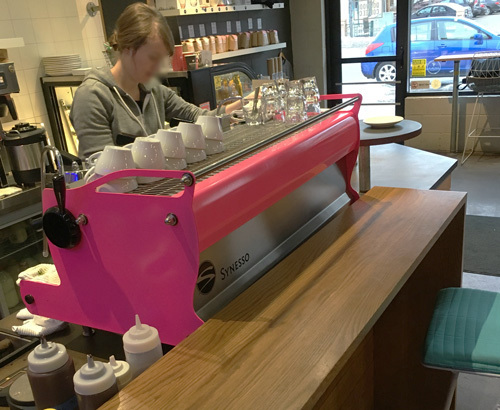 Cup — The barista was slammed dur­ing our vis­it but remained bright & cheer­ful. She deliv­ered a lat­te and a “fef­fer” that were works of art. The lat­ter is described in terms of “a pfef­fer­neusse cook­ie dressed up as a lat­te.” Both were excel­lent. 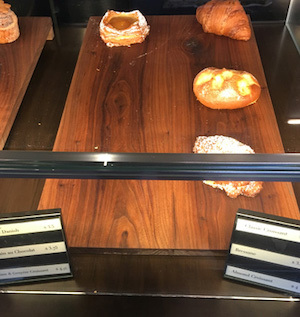 Food — Baked goods, filled crois­sants sal­ads, and a few piz­zas. We ordered a turkey/​Swiss crois­sant and a nutel­la crois­sant. The choic­es were quite lim­it­ed when we arrived, due to the crowds I assume. Music & noise — Loud & live­ly when the place is crowd­ed, as it was dur­ing our vis­it. Music plays at a low lev­el and was not dis­cernible above the con­ver­sa­tion. The ceil­ing is high and seems to absorb some of the noise. These reviews make me want to go out for cof­fee! You’re get­ting the idea then! Glad you enjoy them. Enter your email address to subscribe to Kinda Different and receive notifications of new posts by email.